This article will show you how to create new listings on Sears from Solid Commerce. Item Class is the name Sears uses for its product categories. Item Class Templates are the better option if you want to use many of Sears's attributes to provide additional details about your products. Variation listings also use Sears' attributes, so using Item Class Templates makes creating variation listings easier. If you create listings using Item Class Templates, you will need a different template for each category you list to. The Generic Template is the better option if you don't need to populate Sears' attributes. It is possible to provide attribute data using the Generic Template, but providing attributes is much easier with the Item Class Templates. To learn more about providing attributes using the Generic Template, download Sears' attribute reference files. In the Sears Products menu -> Product Mgmt -> Bulk. The Step 1: Supporting Files section at the top contains the links to the two attribute files. The great thing about using the Generic Template is that you can create all your listings using just this one template. You can also add attributes to it if needed. 1) In your Sears account -> Go to the Products menu -> Product Mgmt -> Bulk. 2) Select the Show All Item Classes radio button. In the catalog tree, keep expanding subfolders until you find the Item Class you want to download. You need a "leaf" folder that has no subfolders. Check the Item Class you want to list to. Click the Download button and select Item Class Template (without items). Check Item Class Root Node at the top of the catalog tree. Click the Download button and select Generic Template (without items). On the same Products – Bulk Create & Edit page where you downloaded the Generic Template, in Section 1: Supporting Files (Optional), click on the Item Class/Attributes Mapping (for Generic Template) link. Open up the file and find the Item Class Display Path for your item. All required attributes will say required in the Attribute Type column. Copy the Attribute name of the attribute you want to use from the Attribute column. Paste it in the Attribute Name 1 column of your Generic Template. Pick a valid value from the Attribute Values list. Add it in the Attribute Value 1 column of your Generic Template. If the Attribute Values column is blank, your attribute is free text. You can enter any value in the Generic Template. 1) Open the template you downloaded in Excel. 2) The template's Data Definition tab will show you which fields are required. It also describes each field and tells you how to populate it. Item ID Your Solid Commerce Warehouse ID. The base price that will show on Sears. Don't use a currency symbol. NOTE: You cannot use simple formulas with the word cost like you can with most of our other marketplace integrations. Any field with a drop-down menu Make a selection from the drop-down menu. In Excel's Solid Commerce menu, click Turn inline help ON. In the same menu, click the Convert Sears file to SC format button that appears. The word sears will be added to the front of all Sears' column headers. A few new Solid Commerce specific columns will be added on the left-hand side of the sheet. 5) Fill in the Solid Commerce columns that were added on the left. product custom sku Your Solid Commerce SKU. warehouse id Usually the same as the Product Custom SKU. The Warehouse ID will be sent to Sears as the Sears Item ID. market auto rule The name of the Sears Pricing Rule you want to use to control the prices on your listings. run sears Enter Yes to turn the automation on. We will automatically push your product data to Sears for listing. If you enter No, your product will not list until you turn the automation on. If your product is in new condition, you don't need to populate this column. If your product is not in new condition, select a condition from the valid values. The valid values are also visible when you hover over the column header (inline help must be turned on) or access the Manager Excel Columns help. The sears ground free shipping, sears ground shipping enabled, sears expedited shipping enabled, and sears premium shipping enabled fields are explained in the next section of this article, Setting the Shipping Options on Your Listings. This field determines which Item Class your product will list in. When you download a Generic Template (with items), the export includes the Item Class Display Path for each item. You can copy the paths when listing new items. Download the Item Class Commissions Table Supporting File by going to the Sears Products menu -> Product Mgmt -> Bulk. The Step 1: Supporting Files section at the top contains the link. The file lists all of the Item Class Display Paths. This field is required if you use the Generic Template. You populate it with the numeric code for the Item Class you are listing to. If you have listed items to the same Item Class in the past, you can download the Generic Template (with items). When listing new items, you can copy the Item Class IDs. Download the Item Class Commissions Table Supporting File by going to the Sears Products menu -> Product Mgmt -> Bulk. The Step 1: Supporting Files section at the top contains the link. The file lists all of the Item Classes. 6) If you're using an Item Class Template and have more products you want to list, repeat this process with the next Item Class Template. 7) We recommend saving your populated templates. Opening a saved template is the easiest way to update details on your live listings through Solid Commerce. The sears ground shipping enabled, sears expedited shipping enabled, and sears premium shipping enabled columns work with the sears Shipping Cost: Ground, sears Shipping Cost: 2 day, and sears Shipping Cost: Next Day columns. Enter a fixed number in the corresponding Cost field to set a flat rate (free shipping is discussed below). Leave the corresponding Cost field blank to have Sears calculate the shipping fee your buyer will pay. The calculation is based on the product's weight and the shipping settings you established in your Sears seller account. This option won't be offered on the listing. Leave the corresponding Cost field blank. Sears uses N/A in the Cost field when you don't want to offer a particular shipping option. Our platform doesn't recognize N/A. To offer free shipping to your buyers, enter Yes in the sears ground free shipping column. Sears has their own field for specifying free shipping named Shipping Override. You don't need to populate this Sears column. 1) If you are populating the Generic Template, enter the name of an attribute in the Attribute Name 1 column. You can tell if you can use an attribute as a variation by looking for VARIATION in the Attribute Type column of the Item Class/Attributes Mapping (for Generic Template) file. Populate a valid value in the Attribute Value 1 column for each of your child items. 2) If you are populating an Item Class Template, provide the values that will appear in the drop-down menus by populating one or more of the Sears attribute columns that have variation in the column header. For example, Size columns. 3) In the Variation Group ID column, enter the same number for each product within the variation family. This value specifies which items belong in the variation. Check out the Sears Data Definition tab for more info on populating in this field. 4) Sears pulls the listing title and description from one of the child items in your family. You will need to provide all product and listing information for each child item. Child items can have different prices. If they do, a range of prices will display on Sears. When a buyer selects a specific variation from the drop down menu, the price of that variation will display. Click the Upload Data button in the Excel Add-In Tool. Check only the Update Marketplace box. The Sears template is designed to list products that already exist in your Solid Commerce account. If you haven't created your items in Solid Commerce yet, you will need to add at least the following required fields to your template: product name, warehouse name, qty. You can additional fields if you like, for more info, see Creating and Customizing a Solid Commerce Excel Template. You can also use a different file to create the products and add them to inventory before uploading this one. 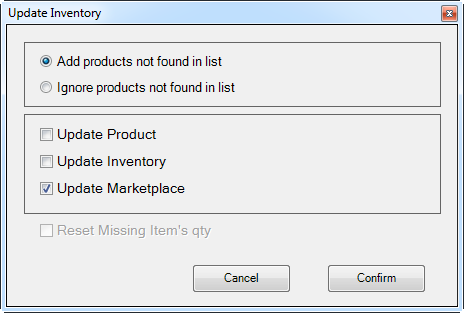 If you add Product and Inventory fields to your template, check Update Product and Update Inventory during upload. We automatically sends quantity and price updates to Sears. To revise quantities and prices you only need to revise the qty, sears qty exp, or sears price fields. We can also push updated listing details to Sears, but we need to resubmit all of the fields, not just the fields you want to revise. That means the file you upload to Solid Commerce needs to have all relevant fields populated. We recommend saving the files you use to create your listings to make editing live listings easier. For full details about updating listings, please see Updating Listings on the Sears Marketplace.